If you doubt that, take a look at the ‘wonderful’ job the VA has been doing since, well, forever ago. A better example is how the British ‘Health Care’ system treats its own most vulnerable citizens. Babies. Toddlers. You are probably already familiar with the story of Charlie Gard from last year. We covered it. It was tragic. In short, the parents of an infant that the UK health care system was unable to help had crowdfunded substantial money for his care in an American facility, willing to treat him that had promising more advanced treatments available. They were fought every step of the way in the courts, and the hospital refused to let the parents remove him from their ‘care’. Despite worldwide support for the baby to receive care elsewhere, including Trump and the Pope, the courts decided it was in Charlie’s best interest that he die. Had the case not been dragged out forever in the courts, he may have been able to get lifesaving treatment in time. Fast forward to 2018, and history repeats itself. Only this time it’s worse. Much worse. This time, it isn’t an infant, but a toddler. This time, the Italian courts conferred honorary citizenship on Alfie Evans in an effort to rescue him, and admit him for treatment in an Italian hospital. A helicopter was literally on standby to airlift him to help. The British Authorities? They sent a line of policemen in to keep the parents from spriting their own child to safety. Of course, at the very same time little Alfie was fighting for his life, a new British royal was born. HE would never have been denied treatment. They wouldn’t DARE. HIS parents would never be told they have ZERO authority over the health care choices of their son. But they’re ‘special’, you see. And that’s how Socialism works. Some people are “more equal” than others. What happened to little Alfie? He was — quite literally — sentenced to die by his own government. His life was deemed not worth saving. Socialism has literally enslaved UK citizens. An unthinking, unfeeling government apparatus has final authority over a child, parent’s wishes be damned. 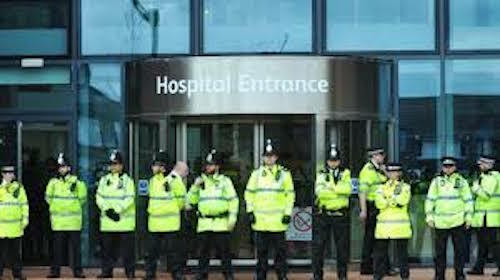 Police blocking the entrance to the hospital, lest someone run in to interrupt the State’s death sentance on an infant. The courts ordered that little Alfie Evans be taken off life support. He was expected to die. But still he lived on. Because sometimes doctors are wrong. They ordered that food and water be withheld. He lingered on for days. Dying of hunger and thirst. Great Britain’s government has stationed police around this precious child so his parents can NOT take him to Italy for care. Now they’re denying this child FOOD & WATER!! This is PROOF that governments do NOT make good parents! These are the Death Panels we told you were inherent in socialism. The ‘free healthcare’ has a finite budget. So they need to make decisions about who is worth the trouble of saving. It’s a problem baked right into the system. Just like Venezuela. How many Venezuelans do you think will be bragging about their ‘free health care’ now? In a just world, every person responsible for commanding and enforcing Alfie’s gruesome death sentence would get to know exactly what an extended period without food and water really feels like. But of course, nobody will pay a price, political or otherwise. The government commanded it, after all. They were ‘only following orders’. Because the ‘only following orders’ defense was perfectly adequate in Nuremberg — right? Alright everyone, don’t forget — the last person to leave the UK, needs to turn out the lights. 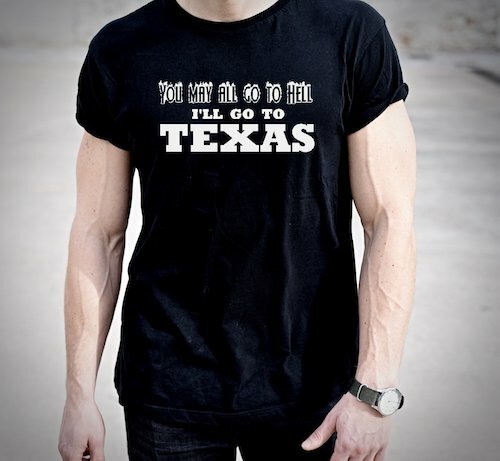 When it’s time to pack up and move on, Col Davy Crockett knew where his next destination should be.